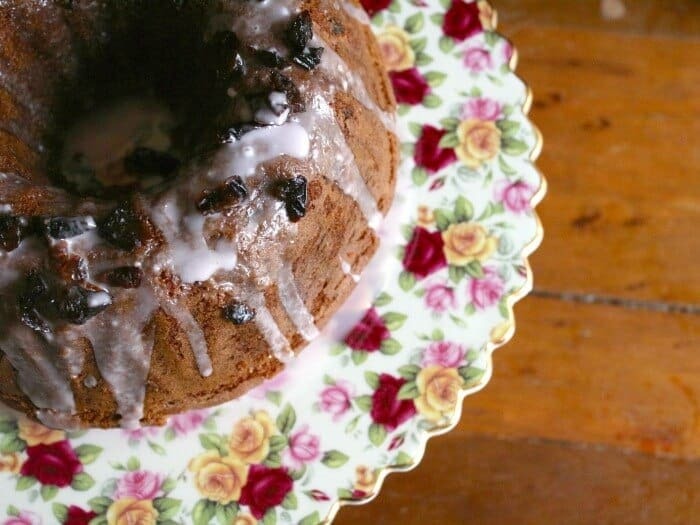 This spicy prune bundt cake recipe is an old fashioned favorite made healthy. Sweet, moist, and with a spicy kick this is one of those cakes you want to make again and again. 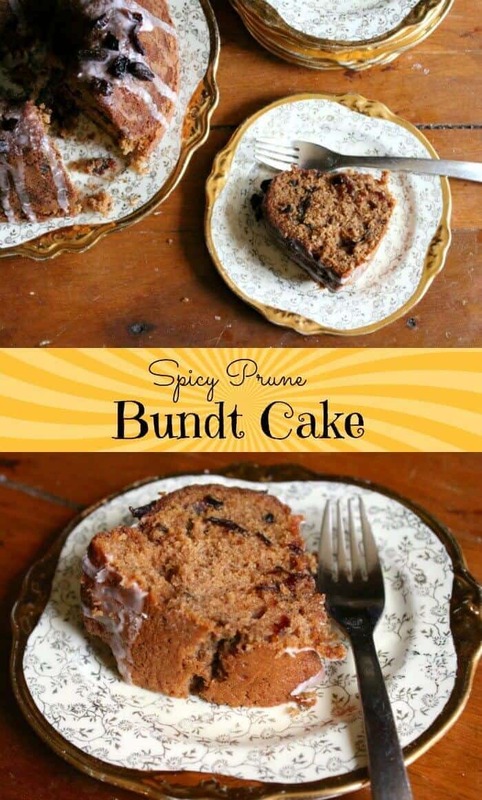 If your family balks at the word prune just call it a plum spice cake. I don’t know about you but I get tired of all of the “it’s-January-so-let’s-be-super-healthy mania. It isn’t that I don’t like healthy recipes — I do! It’s that I think you need to eat things all year long that are healthy, and healthy shouldn’t have’t to mean flavorless, you know? I am one of those weirdos that likes dried fruit of any kinds — and prunes are no exception. They are sweet, I like the texture, and they are high in fiber and iron and potassium and God knows what else. They’re healthy, y’all, but they don’t taste healthy. Sunsweet® sent me several of their products so that I could create my version of a healthy snack. Keep in mind that to me flavor and texture and primary — I really don’t care how healthy it is if those things aren’t part of the package. I was especially interested in the PlumSmart® Light juice. This juice is made from a special variety of fresh, juicy plums and has only 60 calories and 15g of carbs — plus it’s a good source of fiber. I wondered how it would work in a spicy prune bundt cake recipe as a replacement for the dairy I’d normally use. Guess what? It works great! Less sugar, too! I know some people might not think of a bundt cake being a healthy snack but this one really is. It isn’t difficult to make at all – the Amaz!n™ Diced Prunes get tossed in without you even having to pick up a knife! Once it’s baked you can leave it as is, sprinkle it with Confectioner’s sugar, or add the PlumSmart® glaze. It stays moist for several days and it is very sweet and satisfying. You can use your favorite sugar substitute as long as it measures the same as the sugar, or if you prefer you can use regular sugar — just keep in mind the nutritional information will be different. This yummy slice of good-for-you looks like a cake but it’s really just as delicious as a breakfast bread, too. Spread a little cream cheese on it — I like the combination of the tangy cheese and the sweet prune flavors! 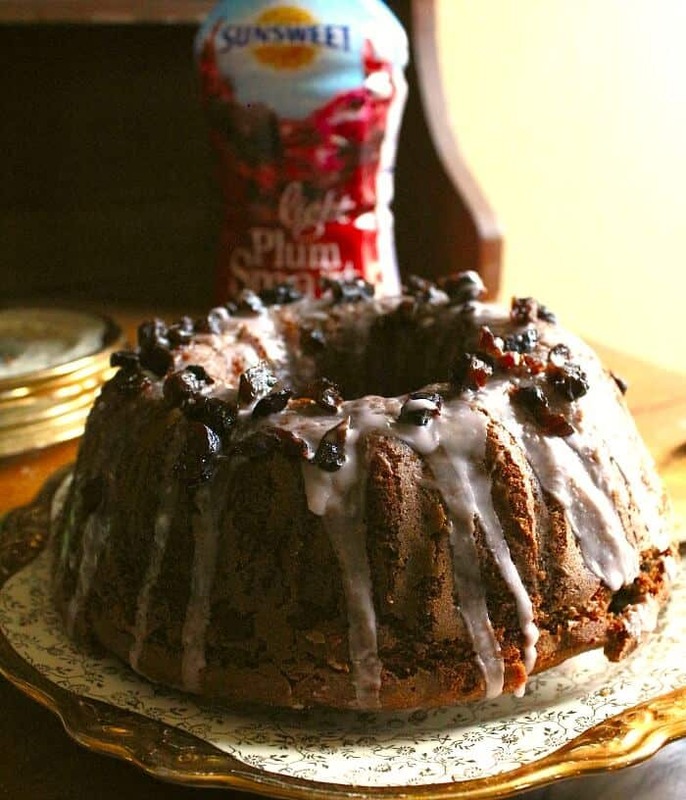 This spicy prune bundt cake recipe also freezes well so you can keep it on hand for sweet tooth emergencies. A spicy, moist prune cake without a lot of added sugar. It can be made dairy free by substituting coconut oil for the butter, too. Call it a plum cake and your family will love it -- don't tell them it's healthy. Cream the butter, sugar substitute, and brown sugar together until light and fluffy. Add the eggs, one at a time, beating about 3 minutes after each addition. Add the dry ingredients to creamed mixture alternately with prune juice, beating well after each addition. Fold in the diced prunes. Spoon into a greased 10-in Bundt pan. Bake at 350° for 40-45 minutes or until a toothpick inserted near the center comes out clean. 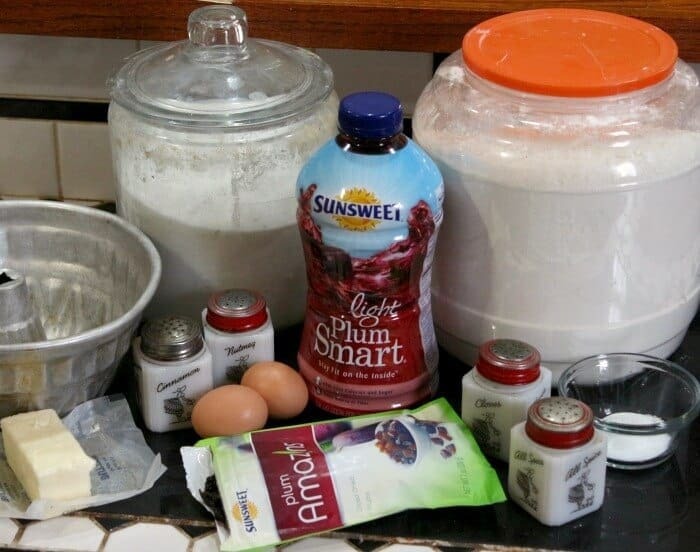 Mix the Confectioner's sugar, vanilla, and enough prune juice to make a thick glaze. Sprinkle with more diced prunes if desired. Thank you for the nice cake recipe. Have a great weekend. Very inventive use of the prunes/plums 🙂 I love them too – I think they are a pr person’s opportunity waiting to happen! This really looks amazing. Very clever use of them. thank you – it is delicious! Prunes are such a great way to sweeten naturally! This cake looks wonderful…it would go perfectly with my afternoon cup of tea. Yum! It really goes exceptionally well with Earl Grey… if you are so inclined!